Posted by I'm so tired of winter. 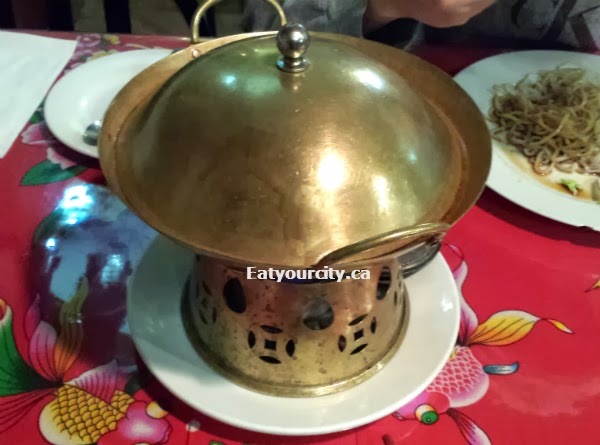 To warm up, we headed to Old Szechuan where while I may still need to keep my coat on in the very homestyle home-restaurant, at least the fiery tasty food will warm us up! We're not stranger to this hidden gem - see previous review here and the food is worth it even if the decor is a bit odd and dated. 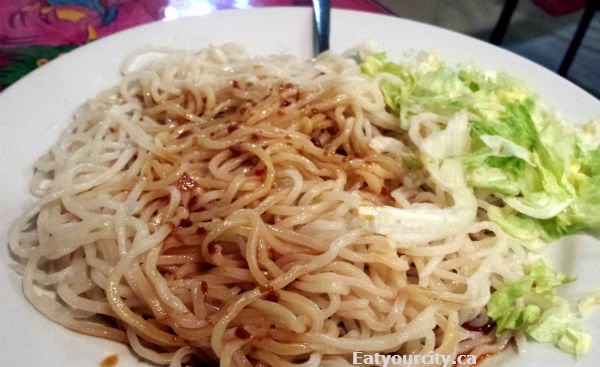 We started off with one of my boyfriend's favorite dishes - #358 Cold Szechuan noodles. You can ask for any dish to be made with 0 to 7 chili spicy level. These handmade noodles are super al dente, an addictively spingy mouth feel, and you toss them in a tangy, savory awesome sauce where the fragrant citrus like Szechuan chili oil kicks in at the end of every bite. The shredded lettuce adds in a bit more textural element, and helps cool down your mouth. Delicious! Since it was just the two of us, we ordered a little extra for variety and to pack home for a tasty lunch. Since it was cold, and we've seen lots of other tables order a little hot pot that comes with a mini stove to keep it warm, we went with a Pork and tofu hot pot. They have vegetarian options as well. It took a little while for it to get super hot and bubbly, but well worth the wait. In the aromatic and spicy broth redolent in garlic, ginger, corriander seeds and chilis, there was slices of crisp peppery diakon, generous amounts of pork spare ribs and cubes of frozen tofu. Once you freeze fresh tofu and then cook it, it gets quite firm and has lots of sponge like pockets that are perfect for absorbing up flavors and broth. Let the ribs soak in the broth for a bit so it picks up more flavor. We had some Stir fried green beans for greens. These green beans are deep fried and tossed in a super savory and salty mixture of garlic, pork belly? and dried shrimp. Its packed with flavor and so addictive! Along with some bowls of steamed jasmine rice, we had my boyfriend's fav - #178 Diced chicken with chili sauce. We're wimps, so we picked out almost all the Szechuan chili peppers that give this dish its characteristic heat and citrus like flavor. The chicken is moist and infused with some citrus notes from the Szechuan peppers, as well as plenty of garlic and ginger flavors. Nom! And since my boyfriend got to order his favorite noodle dish, I got to order mine - the #359 Minced pork and vegetable with sweet bean sauce over noodles. Though this dish has no chili peppers in it, the residual spice from the other dishes gave it a bit lol! Veges and lean pork are so finely minced, you'd neer realize there's vegetables in this creamy rich and slightly sweet meat sauce that you mix up with some warm hand made noodles and crisp shredded lettuce. Nom! Overall, a great place to warm up with traditional Szechuan food. Just be prepared to sweat, flush, sputter and guzzle ice cold water if you don't keep things below a spicy level of 3. Or are you game for a dish at the ultimate 7?